As my Husband is on business trip this entire week, I am not cooking anything elaborate these days and so I am preparing simple and easy dishes for me and clearing off the vegetables that I have in fridge.Believe me I am not spending more than half an hour in the kitchen for the entire day.Bread,Dosa(batter I prepared in a huge vessel),simple rice and sabzi,Maggi have become my daily food these days.I am sharing you one such simple chikkudukaaya sabzi that I have prepared recently.Even though it is bit time consuming,it does not require constant attention from us. 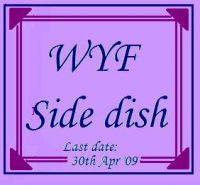 This is second entry to WYF-Side dishes by EC of Simple Indian Food. Heat Oil in a kadai,crackle mustard seeds and jeera and add chana dal,urad dal,curry leaves and fry until they turn red. Add chopped onions and fry until golden brown,add chopped tomatoes and fry until it is slight mushy. Add chopped broad beans/chikkudukaaya and give a good stir and cover it with a plate and pour water over it.keep it in low flame and cook for 15-20 mins giving a stir occasionally(It should be cooked completely with the steam produced by this process,eventhough it is time consuming it adds better taste to the curry). Add red chilli powder,dhaniya powder,jeera powder,turmeric,salt and mix properly. mmm, I had this yday... I love to have Chikkudukaya for dhall... So how do you while your time at home (after quick cooking and chores)??? Oh wow looks droolworthy...This is my favourite....Are u from Andhra? Thank u for the comment and visit Prathibha.I too lov these beans,it taste diff than other beans..
chikudikaya is one of my favs prathibha..Sad part is i cant get them here..yummy..
We hardly cook with these! Both our families don't like this, so never eaten this. 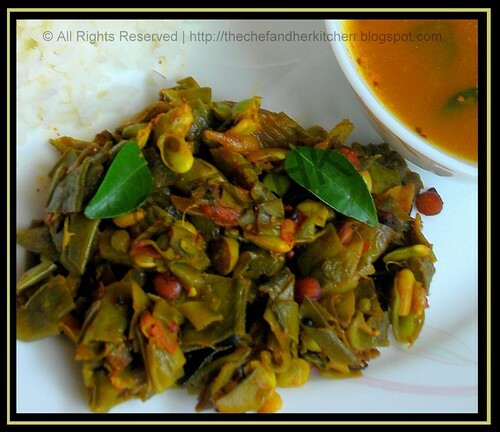 @vrinda, @ A_and_N thanks for visiting my blog..
Hey...Chikudukaya curry looks delish! I love this curry but never made after coming to US. We make it with coconut and poppy seeds. Urs looks good. Curry looks yum Prathibha....i love chikkudukaya...we don't get fresh ones here. I havent had this bans .Sounds delicious. I too have dosa or noodles for lunch when i am alone. And I hate to cook for myself..
@vishali, @ deepa, @lavanya @priya, @divya,@ LE...thanks for your comments..
@pavitra Thanks a lot for thinking about me and passing an award...Thanks a lot lol..!! Yummy and simple broad beans curry..I usually add some grated coconut in the end. I like your spicy version! sometimes its simple food like this that makes me happy :) lovely recipe! @Madhu even i add grated coconut for the normal french beans palya, but for this beans i do not add..
thank you shama and gita..